Gray Hair AND A BOOK SIGNING! My Town Monday: Guess Who? Fair warning: This may be my SHORTEST My Town Monday post ever! Because I'm writing I So Don't Do Makeup like a wacked-out crazy woman. BUT....I love My Town Mondays. And I couldn't bear to miss a week. So, I figured a short post was better than no post. AND this particular post is sure to appeal to Travis Erwin, Our Fearless Fishing Leader, because it's about DEEP-SEA FISHING! SO, without further ado....There are several companies in San Diego who will happily take you out to sea for a fishing adventure. You can go for 1/2 day trip to a few weeks. The term for a trip longer than a day is "long range." You can go if you're a beginner. You can go if you're experienced. In general, the fishing companies provide the tackle (rod, sinkers, other fishing paraphernalia). When you're checking price, check if the fee includes a Mexican fishing permit (and if you're going far enough south to need one). A little trivia: by law, fish cannot be filleted in Mexican waters. These are the kinds of fish you'll catch from 3-10 miles offshore: calico bass, sand bass, white sea bass, barracuda, mackerel and dorado. And from 60 to 80 miles out, you'll catch albacore, bluefin tuna, yellowfin tuna, big eye tuna, skipjack and yellowtail. The deeper you go, the bigger the fish. In 1997, someone caught a 388-pound yellowfin tuna! To put this in perspective, a yellowfin generally weighs 15-30 pounds. And here's a little tip. Always, always, always, pay the $2.00 to enter the jackpot. If you happen to catch the largest fish of the day, you get to take home the kitty. And, btw, I will never ever go deep-sea fishing you. As in, never. Why? Because I don't have sea legs. Even with dramamine. Please swim on over Travis' blog where he'll have a fun post and links to other participants. Come and meet my new BFF, Susan Patron. I'll be there too. Seriously, if you're going, email me or phone me or something, so we can meet up. It'll be fun! 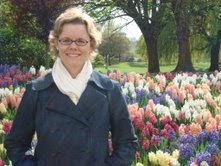 You can find out the connection between Susan Patron and a pink dog, sea urchins and Charlotte's Web. 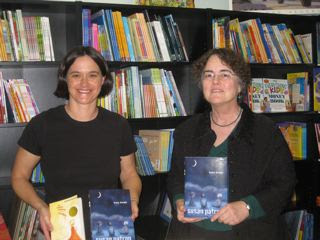 I know it's last minute, but how often do you (and your kids) get the chance to rub shoulders with a Newbery winner? And because I actually did rub shoulders with her yesterday, tomorrow I'm rubbing her head. She's very nice; I don't think she'll mind. Ooooh. We can meet by this very wall! 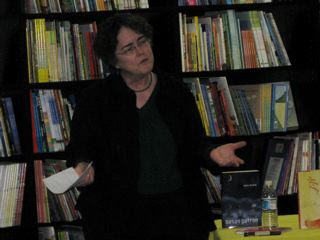 Susan Patron, Author Extraordinaire and Winner of the Newbery Medal! Yesterday I made a new BFF. She may not have realized it, but I emailed her the url for this post, so she'll know soon enough. My new BFF is SUSAN PATRON. She is the author of The Higher Power of Lucky which won the John Newbery Medal in 2007. The sequel, Lucky Breaks, was released recently. Susan is writing the third book in this middle-grade trilogy. If you haven't yet read The Higher Power of Lucky, you truly should; it'll be one of your best reads this year. I went to the Yellow Book Road (San Diego's indie children's book store) to loan Susan my projector for her powerpoint. Really I went to hang out with her and chat and fawn and follow her around and listen to her presentation. The projector was a great excuse. -She is a very interesting speaker. I learned enough about her to want to learn more. -She is gracious and thoughtful and respectful. -She has an excellent sense of humor. Excellent. -She has a dog that turns pink. She does not eat sea urchins. Charlotte's Web convinced her to become a writer. I'd like to say this is insider BFF info, but actually you could learn all about these details if you get a chance to hear her speak. 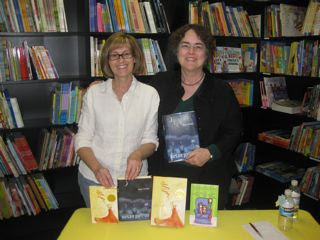 So, Susan Patron, I absolutely loved meeting you. I think we should plan a slumber party soon. We'll stay up all night eating junk food, doing each other's makeup and watching DVDs. Me and Susan Patron. I do not know why I forget to push up my glasses. Bottom line is I need new frames. Cuter frames. With staying power. Mary is also my BFF. Right, Mary?! The following is fairly off topic, BUT I keep forgetting to take care of it. 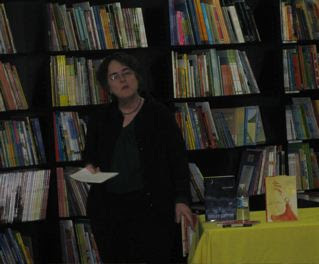 So.... a huge thank-you to Mary Hayward and Kristin Baranski (co-owners of the Yellow Book Road) who have highlighted I So Don't Do Mysteries on their store's website. Right here. 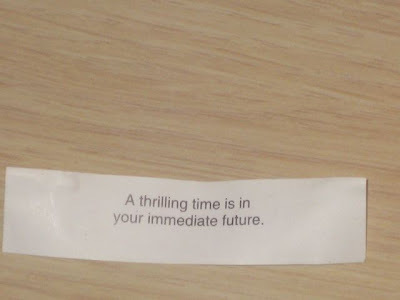 Must go out for Chinese more often if I'm going to get fun fortunes like this one. A confession: Once, my little sister and I (we were teens, I think) painstakingly removed the fortunes from about a dozen cookies. We used pins to tweezer them out. 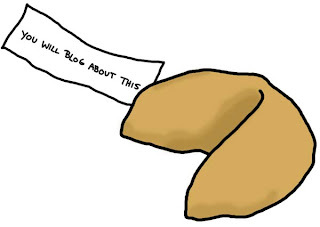 We typed up new fortunes, folded them and poked them in the cookies. These "new and improved" fortune cookies were for a family get-together at my aunt's. At the last minute, my little sister backed out of going. Which left me at a dinner party with a bag of fortune cookies bearing rude and inappropriate messages! I will never forget the perplexed look on my aunt's face as she questioned in a high, sweet voice, "Where did you get these fortune cookies?" And, of course, you can borrow this idea! It's that time of the week again! My Town Monday! And today we're visiting the town of Fallbrook for their annual Avocado Festival. 1. I have never met an avocado I didn't like. 2. The festival is coming up in April and just on the incredible off chance that any of you might meander out this way, I want you to be in the know. First, a teeny bit about Fallbrook: It has a population of about 30,000 and is located in the northern sector of San Diego County. The town lost about 100 dwellings to the Oct 2007 wildfires. Fallbrook's main street is a bit off the beaten track which means you leave Highway 15 and drive west for about six miles on beautiful windy roads to get to the town proper. Fallbrook is 18 miles from the Pacific Ocean. Here are a few famous people who have lived in Fallbrook: Frank Capra, Rita Coolidge, Tony Hawk, Tori Spelling. AND, surprise, surprise, Fallbrook is well known for its avocado groves. 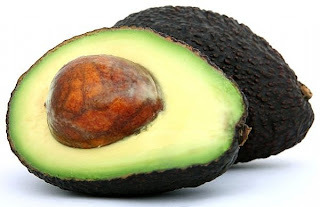 On Sunday, April 19 from 9 am to 5 pm, the quiet village of Fallbrook will host its annual Avocado Festival, also referred to as the green crop festival. About 70,000 people will descend upon the town to enjoy the craft and food booths, culinary contests and demos, farmers' market, live music. 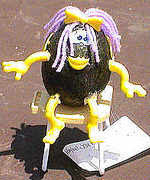 A couple of fun contests for the kids are the Best-Dressed Avocado and the Avocado 500 (where you build and race a model car made of an avocado). I think there's also going to be a "pit spit" contest! I have at least one son who could walk away with a first! 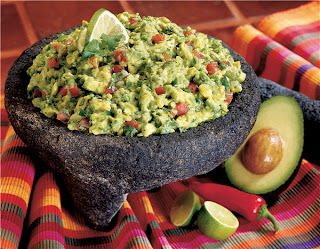 Culinary contests include Best Guacamole and Most Creative Avocado Dish. I will not enter, but will happily taste-test if requested! Child #4 would so rock at the Best-Dressed Avocado contest! A little trivia about avocados so that you can dazzle everyone with your brilliance: They are also called butter pears and alligator pears. "Avocado" comes from the Nahuati (Aztecan) language and means testicle. 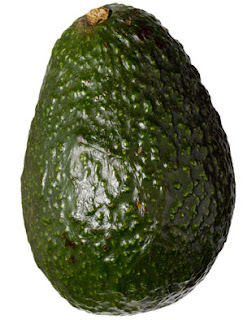 Your average avocado tree produces 120 avocados a year. I'm not sure I can convince dh to hit this festival with me. But I know Child #4 will be game. She's at that perfect age (she's 8) where she's enthusiastic about everything! If you're going let me know. Maybe we can meet up for some guac and chips. Our regular head honcho, Travis Erwin, has moved and is somewhat settled in. He's back to hosting My Town Monday. Please visit Travis' blog where he'll have a fun post and links to other participants. And I'm off to write! Have a great day, all!! Guess what I'm doing? You got it! Writing my little heart out. I'm working hard on the third Sherry (short for Sherlock) Holmes Baldwin tween mystery, I So Don't Do Makeup. While it's pretty much plotted out, there are always surprises. Plot stuff that looks like it makes sense in the outline, but doesn't on the page. Characters who decide to take matters into their own hands. Children who forget their swim gear, thus forcing their busy, focused mother to make an additional trip across town. Yes, Child, #2, I'm referring to you. But, but, but...I didn't want you all to feel forgotten. AND I've been given a couple of very adorable awards and must link and thank and even list some obsessions. Say what?? Me? Obsessions? Thank you Barbara Martin for this, well, fabulous award! HOWEVER, what makes you think I have ANY obsessions, let alone FIVE?! 1. The first obvious one is licorice. If you've been reading this blog for even a little while, you'll know I adore adore adore licorice. Red. Black. I adore you equally. Way, way more than chocolate. Which I don't really adore at all. 2. Disposable plastic gloves. I always have around 500 of these in a kitchen drawer because there are many things I don't like to touch. Such as, raw meat, laundry, certain cleaning supplies (Comet), onions, turkey guts, wet sponges, people. Ha! Kidding about the people. Just checking to see if you're keeping up! 3. Christmas tree ornaments. I buy a new one every year and date it. I try to find an ornament that represents something significant about the year. Some years have more than one new dated ornament because I couldn't narrow down the field. 4. Packing up the night before. I just don't sleep well if I'm not ready for the morning. I haven't managed to pass this particular obsession on to my children. Pity. It would make our mornings much smoother. 5. 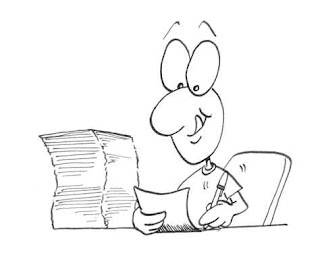 List making. I don't know how people navigate life without lists. And here's an obsession I've successfully given up: letting the gas gauge dip below half. My gas light actually came on this morning! Thank you, Barbara Martin for this very fun exercise. Although I'm little worried at how quickly I was able to type out this list! Seriously, folks, I'm reasonably normal, lots of fun and not nearly as odd as this post would suggest! I'll take care of thank-yous for the other adorable awards in another post. Near the north end of the San Diego Natural History Museum, you will find an incredibly large tree. By incredibly large, I mean 78 feet high, 123 feet wide, and with a trunk girth of 486 inches!! At least, that's what it measured in 1996. 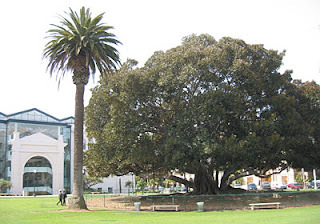 The Moreton Fig tree, an East Australian native, was planted from a five-gallon container in 1914. Many trees were planted in Balboa Park around this time to prepare for the 1915 Panama-California International Exposition. 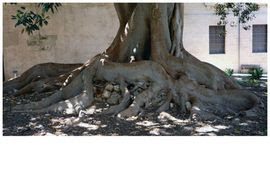 Here is an example of a Moreton Fig tree and its roots. This isn't the tree in Balboa Park, though. When I first moved to San Diego, you could actually climb on the aerial or surface roots and sit under the tree for a picnic. However, all this foot traffic began to damage the roots and affect the health of the tree. In 1989, a fence was built around the tree, which has completely recovered and is doing very well now, thankyouverymuch. People do still picnic under the tree. The Moreton Fig tree and the fig wasp share an interesting relationship. The tree is only pollinated by the fig wasp. 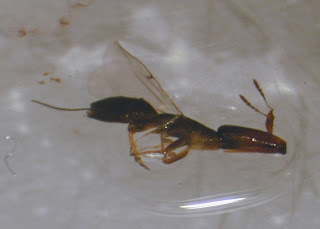 And the fig wasp can only reproduce in fig flowers. In this complicated world of dating and courtship and global warming, this doesn't seem wise! In the interests of fair reporting, I must tell you that the famous Santa Barbara Moreton Bay Fig tree has a wider canopy than ours. However, the tree is shorter. The two trees are listed as CO-CHAMPIONS in the California Registry of Big Trees. No, I am not making this up! The largest Moreton Fig tree in the world is located on a cattle farm near Egg-rock in Queensland, Australia. It measured ONE HUNDRED SIXTY-ONE FEET in 2006! Our regular head honcho Travis Erwin is moving. Although he still managed to post a My Town Monday! Jenn Jilks is pinch-hitting for Travis, and she'll have all our links. Thanks Jenn! 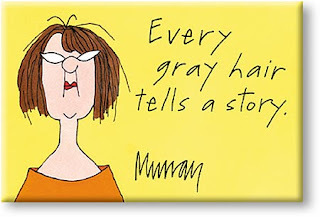 Read an interesting article the other day on why hair goes gray. do NOT live with teens. Here's the phone number (619-220-0175) in case you just want to call and chat. KIDDING! Come and hang out with me. Unless you live in Florida or Canada or somewhere far away like that. Then again, maybe you have a bunch of frequent flyer miles and you're intrigued by all the My Town Monday posts about San Diego. So, come visit San Diego AND hang out with me this evening at B&N (Hazard Center). Anyway, now you know where I'll be spending my Friday evening. And I'll be wearing THE jeans. This past Saturday, I did a signing at a Barnes and Noble a little up the coast from here. There was a guy named Victor (mid-twenties, at most), a B&N employee, who stood near me and by the entrance. He asked each and every entering customer if they'd like to sign up for a B&N membership. And wished each leaving customer a good day. Anyway, Victor isn't quite right. He has a leg that doesn't work well, a slurred speech pattern and a perpetual smile that's just a little, well, too perpetual. Victor and I got to chatting. He said he'd like to write a book one day. I think a lot of people want to write a book. Probably because everyone has a story, a different take on life. I really like to hear the varied premises. Okay, guys, take a breath....He'd write about the drunk driver who ran into his family's car when Victor was five. Victor's dad was paralyzed. Victor's mother was thrown from the car and suffered broken bones only. And Victor became, well, Victor. I was packing up to leave when Victor tapped me on the shoulder. He'd bought a copy of I So Don't Do Mysteries. A girly middle-grade mystery. In hardback. Victor probably makes a hair above minimum wage. "I want to read about the places in San Diego I heard you talking about to everyone," Victor said, handing me the book. "And I want you to sign it." Victor, I'm so glad I got to do a signing next to you. You should write your book. Definitely. Lots of famous people end up living in San Diego. Why? Because we're a fun and interesting and delightful lot down here. Oh fine, because we have terrific weather. See if you can guess who this is. This children's author moved here in 1948. He lived in San Diego until 1991 when he died here of cancer. He wrote under a pseudonym. He wrote and illustrated 44 children's books. His mother chanted rhymes to lull her children to sleep. Other things this author did: He was a cartoonist. 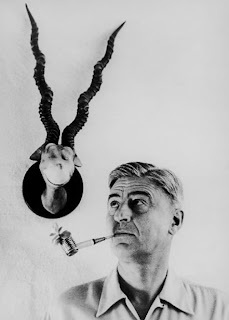 He worked for 15 years in advertising (creating campaigns for Standard Oil). He developed animated training films for the U.S. military during WWII. He attended Oxford, but never completed the doctoral program. He got married instead. His father always wanted him to be a doctor, so he used Dr. as part of his nom de plume. In response to a 1954 Life Magazine article about the boring state of American primers, he wrote an entire children's book using only TWO HUNDRED THIRTY-SIX different (many of which were exciting) words for a total of 1,624 words. If you haven't figured it out yet, here's a HUMONGOUS clue. Please visit Travis Erwin's blog where you'll find his My Town Monday post and links to the other participants. Congratulations to Sara of Around the Barrios who is the proud winner of a signed copy of PJ Hoover's fantabulous middle-grade fantasy THE EMERALD TABLET! Sara, email me at barrieDOTsummyATgmailDOTcom. Then my people will get in touch with PJ's people who will get in touch with your people. Or you can leave a comment on PJ's blog. Or PJ will find you at your blog. She's tenacious that way. Also, thank you to everyone who entered. 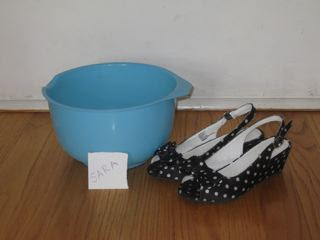 I hope you're all enjoying the above photo with Child #4's current winner-choosing shoes. I swear that child has more footwear than the rest of the family put together. We can only afford her shoe habit because she's eight and her shoes don't break the bank. I predict that about five years from now, we'll be living on pinto beans. 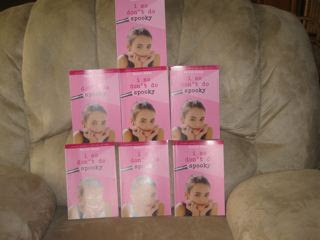 And now, loud obnoxious drum roll, I'd like to introduce the cover of I So Don't Do Spooky!!!! Sherry short for Sherlock) Holmes Baldwin returns to solve a second mystery in this series. A mystery involving a stalker and her step-mother, The Ruler. Yikes! I So Don't Do Spooky will be in bookstores this fall 2009. ISN'T THIS A VERY VERY GORGEOUS COVER? I wish I had a high resolution jpeg of it and I'd post a cover HUGE enough to take over your screen! Maybe your entire house! Here is a little shrine of ARCs (Advance Reader Copies). See how they gleam and glimmer? No, it's not just my amateur photography. And here's the brand new cover for the trade paperback edition of I So Don't Do Mysteries. It should be out sometime in the fall too. We're baaack! It's the second meeting of The Book Review Club! We had a GREAT response last month and we're back with a bunch of book reviews in an attempt to TOPPLE your to-be-read pile. So grab a mug of java and a handful of cookies. Pull up a chair and join us for the March get-together of The Book Review Club. You remember KELLY HAYES, one of my Denny's Chicks critique partners? Kelly's the one who's EXTREMELY well read and has a mind like a steel strap when it comes to book premises. AND Kelly's reviewing a book for our book club this month. Take it away, Kelly! This is one of those rare novels that has it all: loss, love, adventure, humor, hope, redemption. And at the core of it is a journey of discovery that starts out as an unconscious act of blind grief. Despite all that, this is not a depressing book. Far from it. Smithy Ide is a big fat loser, literally and by his own admission. He’s a friendless drunk whose only companions are his parents. In the space of a week he loses them both in a car accident and then finds out that his estranged, mentally ill sister has been declared dead in L.A. His response is to get on his old Raleigh bicycle and keep riding. At first it’s to escape the grief he can’t let himself feel. Then it becomes a cross-country journey to claim his sister’s remains. With no money and very few coping skills, Smithy gets by with the help of a few strangers and a childhood friend named Norma. The road trip is intercut with flashbacks of his years growing up with his misdiagnosed schizophrenic sister, Bethany, who by turns loved him and betrayed him. And their caring parents whose love and resources were exhausted by Bethany’s tragic illness. In Smithy Ide, Ron McLarty has created a truly unique character. He’s a man who for many reasons has shut himself off from life. But this journey across the country peels back all his protective layers, one by one, leaving a gentle, kind soul in need of love. At the end of this book I just wanted to put Smithy in my pocket and take him home with me. Which, in a sense, is what I did. Such is the magic of a beautifully drawn character. This is a book that sneaks up on you. It doesn’t bludgeon you with tragedy and comedy. I found myself surprised by tears in one scene and laughing out loud in the next. Smithy’s take on life is so simple and unpretentious, you can’t help but believe it. It has the ring of truth to it. Which is the key to this book—it’s a novel about what’s true. And it’s a truth I think we can all recognize. And here’s an interesting fact about the author. Ron McLarty is a well known actor and audio book narrator. He tried for years to get this, his first novel published, with no luck. Then he gave it to an editor at Recorded Books and she loved it. She bought and published it as an audio book read by the author. Of course, it did so well, it was then picked up by Penguin and published in hardback. I guess publishers just have to be hit over the head sometimes to see the brilliance of a work. The film is slated to come out in 2010, so read the book soon! THANK YOU FOR THE GREAT REVIEW, KELLY! YOU SO ROCK! Apology in advance: If you posted a review and I didn't link to you, sorry, sorry, sorry. Just let me know in the comments. I'll get right on it. It's a special time of year in San Diego County. A time to stop and smell the roses. Well, the Ranunculus, to be exact. 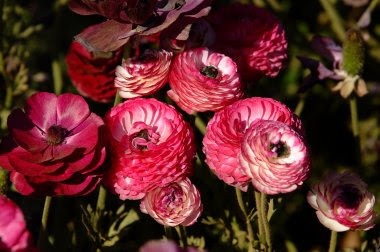 Well, the giant strain of Ranunculus called the Tecolote, to be even more exact. The Carlsbad Flower Fields are open seven days a week from 9am to 5pm from March 1 until May 10. For about $8 (children pay less), you can wander the very very colorful 50-acre flower fields. There is even an outdoor sunrise Easter service at 6:15 am which includes a free breakfast. Here's a little history for you. About seventy years ago, Luther Gage, an English horticulturist, immigrated to Southern California. He brought along some Ranunculus seeds. And this is how the first Ranunculus were planted in North America! The bulbs from this farm are now sold worldwide. And while the area around the Flower Fields has been taken over by development, the Flower Fields will always be run as a flower or agricultural farm because of a perpetuity agreement with the city of Carlsbad. So, if you're ever in the are between March and May, you'll want to work in a trip to the Carlsbad Flower Fields. Maybe on your way to Legoland! And....did you see how there is no food in this week's My Town Monday post?! Please trundle over to Travis Erwin's blog. He's our Fearless Leader for My Town Mondays. Along with his own MTM, he'll have a list of participants.